SAN MARCOS-Dedicated to fairness, accuracy and sports, Steven J. Gaither saw a need for coverage. Making the right plays led him to create HBCUGameday. 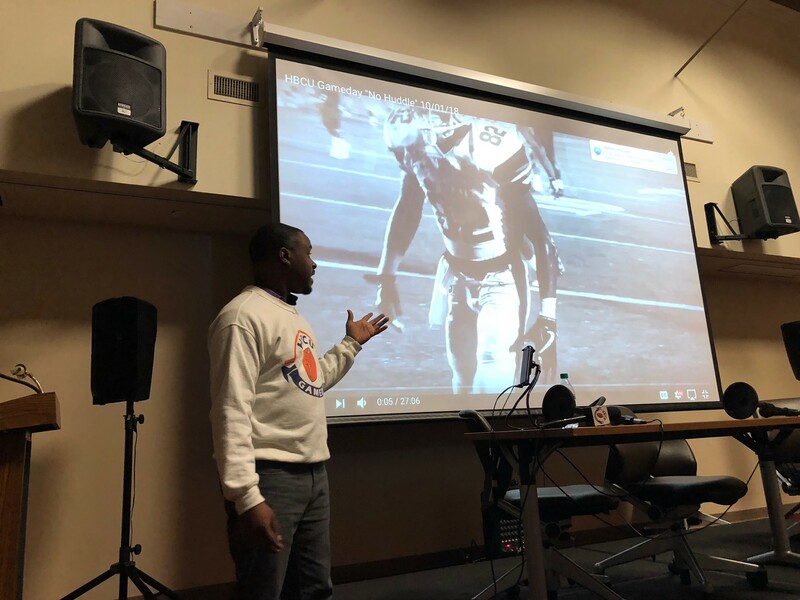 After graduating from Winston Salem State in 2009, Gaither created the HBCUGameday website in 2012 to highlight culture and athletics at Historically Black Colleges. Gaither targets community which has helped increase follower interaction by 35,000 followers on Facebook. “Everyone feels like a star so we [HBCUGameday] want to make them a star,” said Gaither. Gaither began his website by writing and filming HBC games at different schools. He noticed that HBC together forms a large community audience. Two years later, Gaither hired several other journalists to help take HBCUGameday into more than just a blog, but a place for the community to bond. 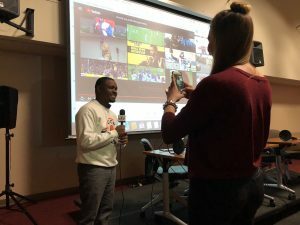 Gaither uses what he calls the “five C’s” to strengthen his reporting, creating collaborative content that connects the community. “When creating a network, you have to have a team of people, creating content, sharing content and investing in you,” said Gaither. He believes the teams networking is what helps connect the community to HBCUGameday. His team works day to day creating stories, video coverage and photo coverage that is unique in those areas. Gaither encourages passion and authenticity. He feels that creating a community fosters conversation about things beyond HBCU sports. It is called HBCUGameday because it covers more than just football, there is the band, cheerleaders, baseball and more. Gaither wants to hook as many people as possible with HBCUGameday. Anytime it can widen its coverage Gaithers team will do it. “The first thing I noticed when I visited the HBCUGamday website was that there were so many different sections, tabs from sports to culture,” said Cate Scanlan, Texas State student. The key to content is the community, collaboration and communication, said Gaither. Getting out of just a journalism aspect and focusing on networking is how HBCUGameday stays profitable. “There are passion and a purpose for what we [HBCUGameday] do and I feel very excited for the future,” said Gaither.